As is so often the case, today I wanted to change the date of some of my GNER Advance Single tickets. 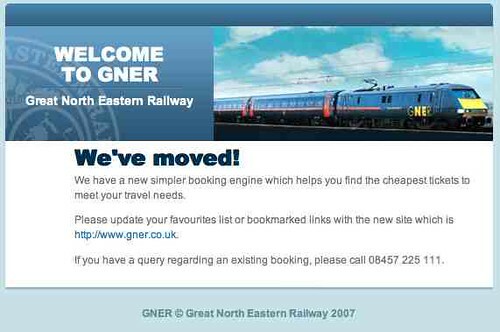 I’ve never written down the phone number of the GNER website support team, so I looked at a couple of the old GNER URLs to see if I could find it. Skip ahead to The Nub of the Matter if you’re not very interested in the gory details. So I rang 08457225111. It was the NXEC customer support number. I waited on hold for a few minutes and pressed a number of option buttons as is the way of things. Eventually I spoke to a human being and asked whether they could change my tickets. They said they couldn’t, but that I should ring 08700101127. So I did. This turned out to be the Virgin customer support number. After the obligatory wait and button pushing, I spoke to a human who told me I had been given the wrong number. I was given a new number – 08457225225 (option #2, followed by option #4). This got me back to NXEC and which was decidedly annoying. They then gave me another number (08700101296) which they said was for “The Train Line” who apparently used to run the GNER website. However when I got through to them, they denied all knowledge and gave me yet another number – 08703665990. This finally got me through to GNER – hooray! I was worried that there would be complications, because the new tickets would have to be issued by NXEC, whereas the old tickets were issued by GNER. But I was pleasantly surprised to be able to change my GNER Advance Single tickets with no more pain than normal (which included giving my credit card details three times – once for each ticket – doh!). In fact the rep I spoke to was remarkably efficient.